How close to not riding? Too close. No matter how our day turned out, it was probably better than this guy’s. It was a long night, a “Kaiser” night dealing with Kevin’s kidney pain issues, but there’s a chance we’ve got a handle on it, and we’re looking forward to better days ahead. But it wasn’t until 1am that we finally got home, which killed getting out for a ride at a reasonable hour. What about an unreasonable hour? No problem there, that’s our specialty! So we’re out the door and heading to the coast at 1pm, about the same time most are heading back. It might not have been the worst timing either, since it was a pretty gray day with Skyline fogged in, but by the time we got to the coast it had almost cleared up. We knew it wasn’t going to be a speed run, since Kevin wasn’t feeling the greatest and he’s missed quite a few miles over the last couple of months. I even told Kevin that before we got to a climb. As if that would matter once we got to Old LaHonda, where I told him, if he really did want to go for it, go for it, just make sure you put a jacket on the second you get to the top so you don’t get cold waiting for me. He ended up not having to wait very long, taking just over 20 minutes while I was right at 22. So much for his hopes of a 19 or even sub-19 time. What was he thinking? One of the real joys of living here is how quickly you can get away to pretty quiet roads. 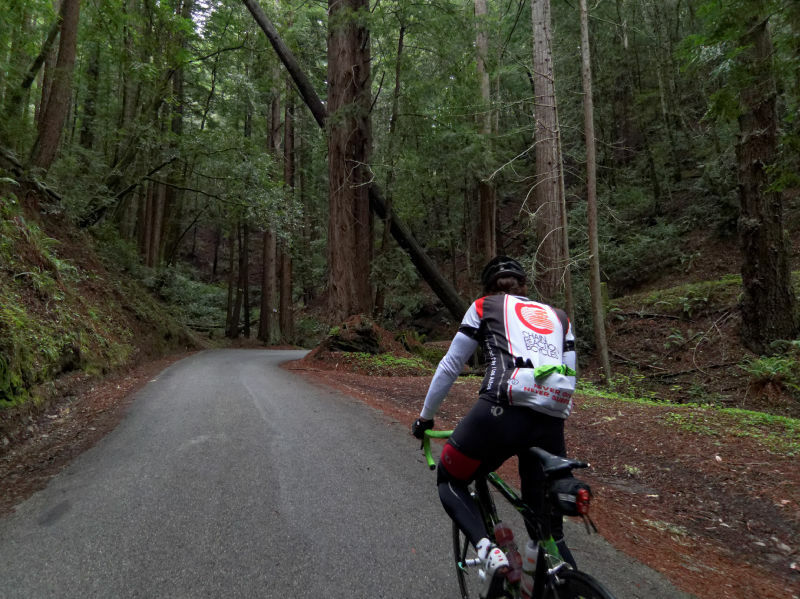 There were so few cars between Skyline and Pescadero you felt like you owned the road. The only time it felt otherwise was on the run north, where we took Highway 1 along the coast, instead of the more-traditional Stage Road option. Kevin’s choice; for some reason he really doesn’t like Stage Road. And for some reason, I really don’t like the noise of all the cars on Highway 1! Kevin’s putting everything he has into getting up Tunitas today! It was on Tunitas that Kevin’s lack of miles showed up, which curiously coincided with me feeling a whole lot better on the steep pitches than I have in a very long time. I had that all-too-unusual (for me) feeling of going faster by just shifting to a higher gear. Yet, while I could have ditched Kevin, I didn’t. I’d pick up speed for a bit, then soft pedal and wait for him. That’s OK, there will be plenty of other times when Kevin and I can have at it on Tunitas. 57 miles, 6100ft of climbing. 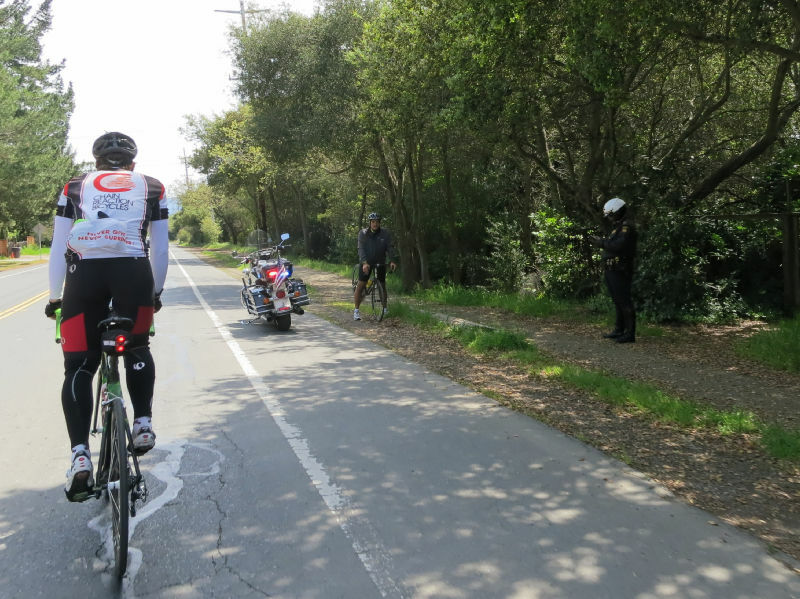 Nothing like the Nifty Fifty in Berkeley today (54 miles with over 10,000ft of climbing!) but it was the right ride for today. Sad that the legendary Flamingo House is no more. The hosue is still there, just no more Flamingos. The flag’s blowing in the wrong direction. Something my friends in Wisconsin won’t see- an ocean! The Bridge of Death on Tunitas, where the road suddenly gets steeper. Tunitas was as tough as it looks for Kevin today.